Netbooks were a no-go topic for Sony for a long time. They did unleash two ultra-mobile mini-notebooks onto the market with the Vaio P11 and P21, but these discerned themselves strongly from the mainstream-netbooks already because of their comparatively high price. The good sales figures of many other manufacturers will have probably let Sony change their mind in the meantime. 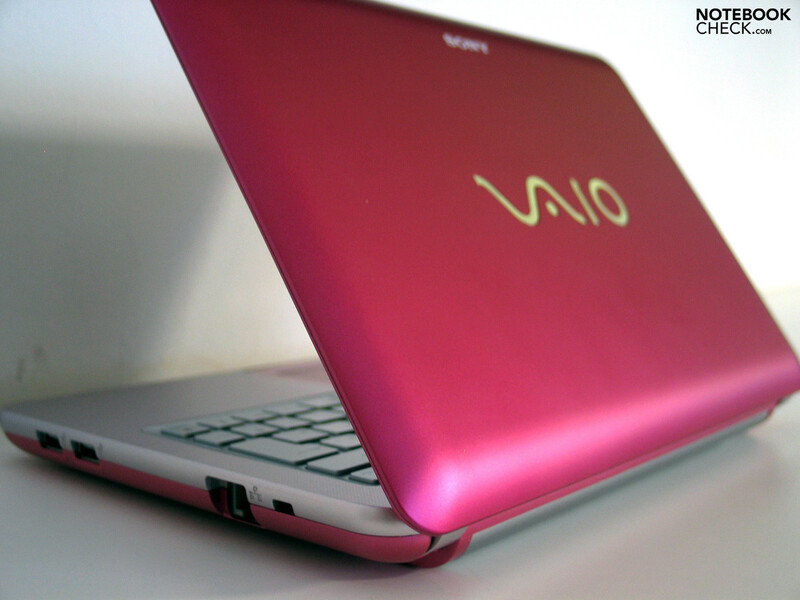 We present: The Sony Vaio W11 with a 10.1" display (1366x768) and an Intel Atom N280 CPU. 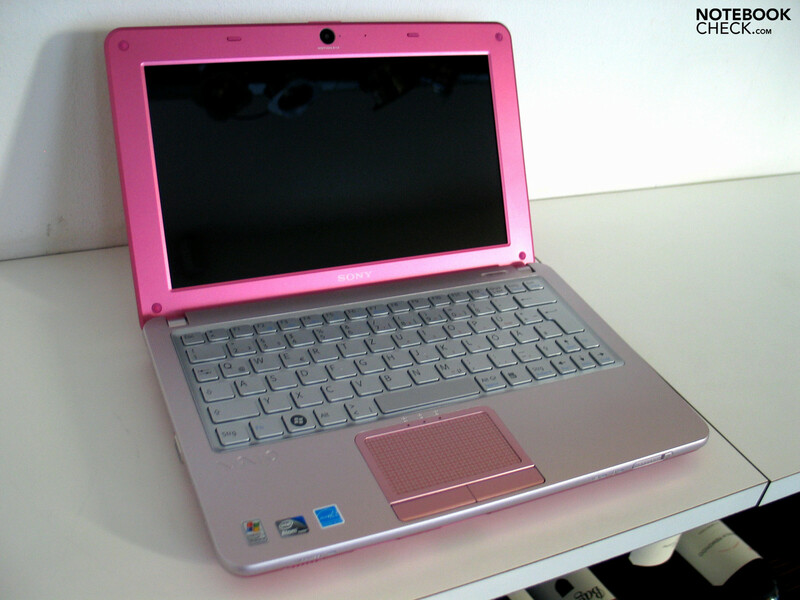 Whilst almost all other renowned manufactures tried to capitalize on the current netbook trend as fast as possible, Sony refused till now, hence more than a year after the emergence of the first netbooks, to "lower" themselves to the level of the cheap cohorts. Instead they brought an independent and new category of ultra-mobile mini-notebooks on the market with the Vaio-P11 and the Vaio-P21 (both already tested extensively by us). Made to even fit inside of a jacket pocket and equipped with a high resolutive 8 inch display (1600x768 pixel!) the sprout belongs, without a doubt, to the most elegant of the available mini-notebooks. But there was a catch: The price. Sony started with short of 1000.00 Euros in the beginning of this year. If you consider that current notebooks are already available for about 300-400 Euros, than the sold quantities were probably kept within a limit – or better said, they were far off from the unbelievable sales figures of the netbook specialists, such as for example, Asus and Acer. And look there, the distance kept to the cheap netbooks has turned into a hobnob. 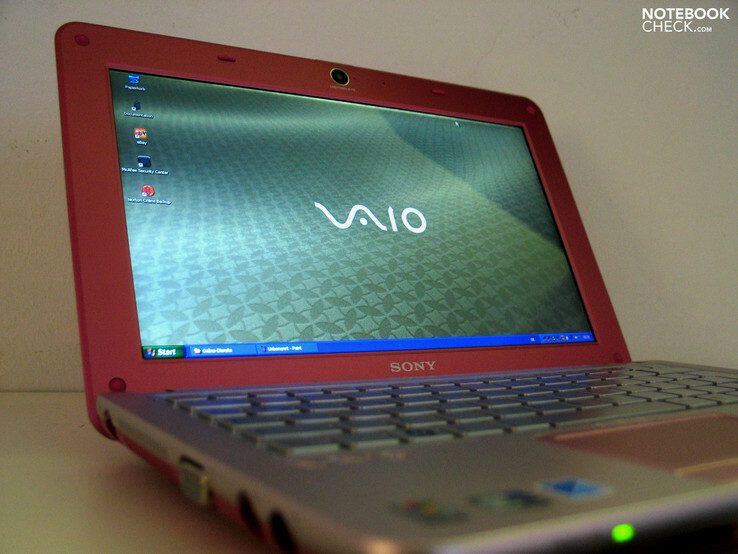 The Sony Vaio W11 comes in a typical 10 inch netbook format and also shows the usual hardware components (Atom CPU, GMA 950). With the in advance announced price of 499.00 Euros (recommended retailer's price) they are once again playing in the upper league of comparable devices, though. It remains to be seen how the market price will finally develop. In Europe there will first be three color variations given: White, brown and pink. Aside from the neutral white outfit and the rather eye-catching pink, the possibly underrated brown device attracted at first sight. 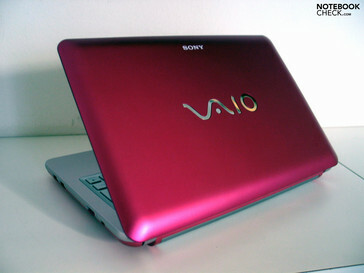 The mini-Vaio's design was attractive and mediated a very compact presentation. The netbook has been pleasantly rounded on the edges. Without agitating edges and corners, but also without a protruding battery, the netbook can very well be picked up at all ends and edges. Incidentally, the Vaio W11 scores exemplary even in view of stability. An extreme deformation under pressure couldn't be established on the base unit or on the display. The device can also be given good marks in view of torsional stiffness. 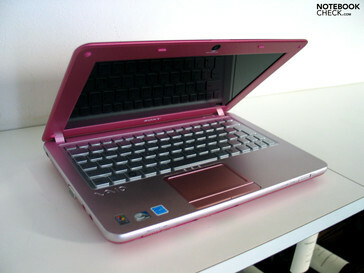 The Vaio even allowed a picking up on the display bezel and carrying around without even the slightest creaking noise. The material impression is kept within a limit, though. Plastic is and stays plastic. A chic metallic finish doesn't help much, either. We could only establish smaller irregularities in the gaps in our first pre-sample in regards to workmanship. The in recent times often met wobbly battery was, even if in a particularly inferior manner, was present also in the single Vaio-W models, regrettably. The display hinges look rather small but they don't really have a problem with the flyweight screen in 10 inch format. They keep the display in the desired position without flapping and with a well-dosed resistance. The omission of a closure has meanwhile become standard for netbooks, hence also for the Sony Vaio W11. The Vaio W11 barely distinguishes itself from the competition in this point. Merely the most necessary is given. In detail: A VGA port for connecting an external monitor and sockets for headphones and microphone on the case's left side and two USB ports and the LAN connection on the right lateral edge. The front edge accommodates two cardreader slots, one for common SD memory cards and one for Sony's Memory Stick. A switch for WLAN and Bluetooth and the on/off button for the device have also been placed here. 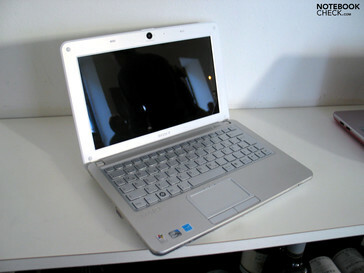 The Vaio W11 has a complete configuration as to communications. To this belongs, for instance the integrated 802.11 b/g/Draft-n WLAN module, Ethernet and Bluetooth. An integrated broadband internet will not be supported in the beginning, this being UMTS/HSDPA. Sony doesn't exclude that the following Vaio W11 (W21?) versions won't be equipped with the according hardware. Of course it's possible to connect the present Vaio via an USB modem to the net. In this case, there will merely be one unoccupied USB port for connecting an external mouse, for example. 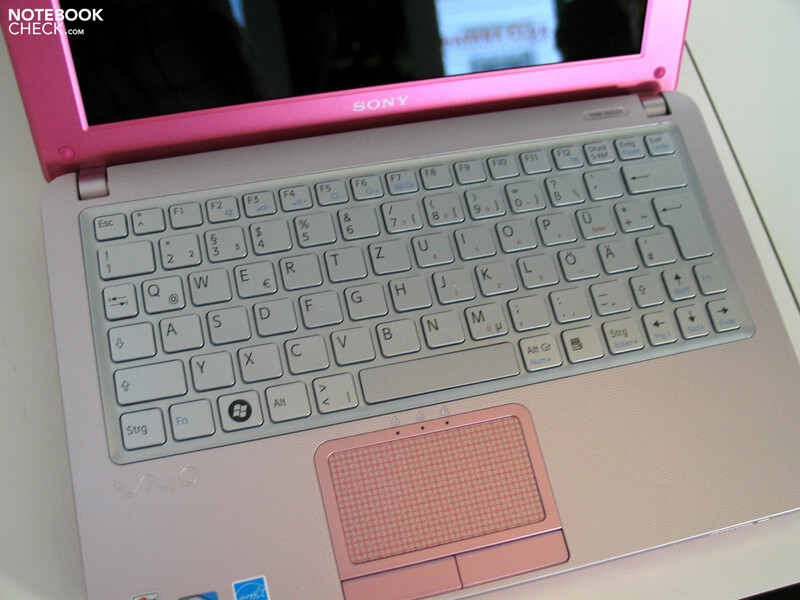 As many other manufactures almost frantically try to practically exploit their netbooks to a maximum from the left edge to the right and to create the given keyboard as large as possible, Sony takes this in a relaxed manner. A keyboard with a single key layout is implemented, as it is known from the, for instance, larger Vaio models. The keyboard leaves an average impression in the first practical typing test. The comparatively small size of the single keys aren't really a problem, however a few layout adjustments left beside the space bar call for a certain accommodation period. The space bar is a tad too far right for our taste. The haptical mark of the F and J key also turned out to be on the lowest limit. The type feel is a factor strongly dependant on the user's subjective preferences. The test samples all had a very soft key stroke with a short to medium depth. It was especially noticeable that a distinctive pressure point was practically missing. The touchpad keys present themselves as the opposite, providing a distinct feedback and were also well-dosed in view of exertion. 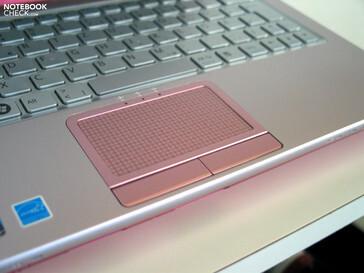 The touchpad itself showed a pleasant and gliding-eager surface. Sony apparently wanted to at least distinguish itself from the mass of netbooks in terms of the display. Similar to the Dell Mini 10, the Vaio W11 has a 10.1 inch screen with a resolution of 1366x768 pixels, hence a 16:9 HD format. Therewith, Sony offers a work surface as they are to a part currently standard in significantly larger 15 inch notebooks. This increases the device's field of application in comparison to the usual 1024x600 pixels in netbooks. The surprisingly generous work surface on the desktop pleased at once. But the display also left a good impression. The first measurement of display brightness revealed a maximum result of a good 230 cd/m2 in the display's central area, measured in battery mode, however. An established black value of 1.13 cd/m2 would give the display a maximum contrast ratio of around 204:1 with– an acceptable result. The color presentation subjectively gives a good performance for the first show. The Sony X-black screen with an LED back light should provide for the necessary luminosity. The reflective glare surface didn't appeal as much. However, it would have counted as a small miracle to be presented with a matt display from Sony. 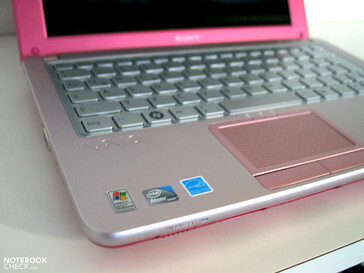 You also have to live without Sony's applied high-quality antireflection coating on the Vaio W11. The screen proved to be especially susceptible in the vertical viewing area of the viewing angles, where the colors distort fairly fast. The display showed itself as far more stable in the horizontal area, where even at dimmed surrounding light disturbing reflections quickly turned up. The P11 and the P21 were equipped comparatively inefficient with the Atom Z520 chip with 1.3 GHz. Additionally the system operated with Windows Vista, which is known for its greed use of hardware resources. The two gigabyte RAM in the devices were therefore very much required. The Sony Vaio W11 strides on the classical notebook path here: Intel Atom N280 CPU with 1.66 GHz paired with the Intel GMA 950 graphic chip set. The tried and tested Windows XP (SP3) is used as the operating system. Thus, the system memory, for example, can also be saved on, and the implemented 1 GB DDR2-533 RAM can be considered as ample. 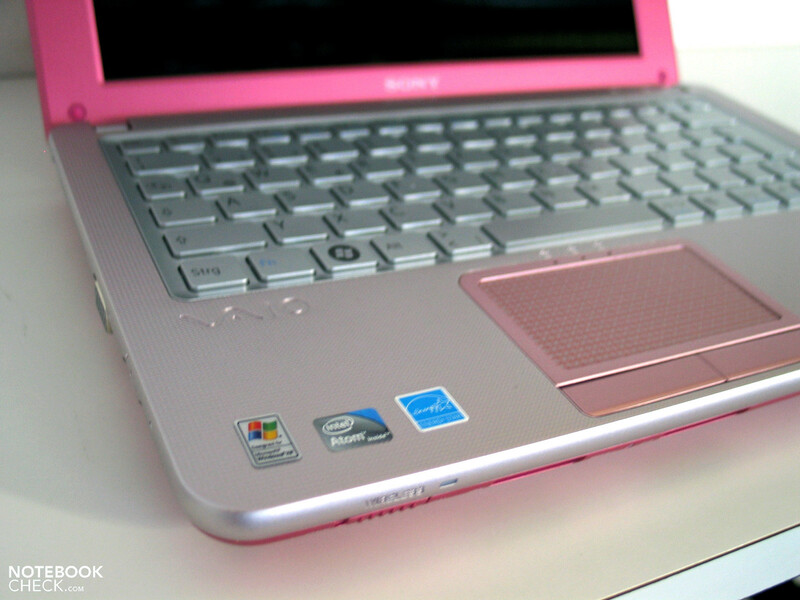 In view of performance, the Sony Vaio P11 is practically on the same level as most other available netbooks. Common office applications aren't a problem for the mite, internet surfing, mail traffic, contact management, word processing, and yes, even the most simple image editing is possible on this netbook basis. If you are also thinking about computer games, we can refer to our special editorial on the topic of gaming and netbooks. Older game classics are very possible with the present Atom netbook range. The introduced platform showed itself as very flexible and fast in use under Windows. Even the prevalent bloatware was searched for in vain. If the devices brought into sale will be delivered optimized to such an extent, remains to be seen. It could get problematic at multitasking because the built-in Atom CPU only has one computing core. Spoilt users of dual (or multi) core systems should therefore adjust their behavior patterns to the system. This includes a somewhat longer waiting time at the start of single applications. In view of system memory, Sony reverts to a common 2.5" hard disk with a gross capacity of 160GB. This should be adequate to have even more comprehensive image and music collections directly available on the device. Intel Atom N280 CPU with 1.66 GHz and integrated Intel GMA 950 graphic chip set. A short cleansing "blow" of the fan was noticed at booting the notebook. Then it regulated itself down again but kept running on a constantly low rotation level. The case temperature also quickly rose to an acceptable, lukewarm level. It has to be added that the surrounding temperatures in the exhibition rooms were over 26-27°C and already provided for a high basic heating of the presented pieces, though. Even if Sony probably wouldn't really admit it, generally we have got a further classic netbook, which has to measure itself with a long list of potential competitors. The Sony W11 naturally has a good chance with the solid, compact case and the highly resolutive display, but it has to still prove itself in the exercises of system noise, case temperature and, especially for mobile use very essential battery life. As usual, the keyboard and finally also the applied display strongly depends on the user's habits. That, what proves to be an absolute "no-go" for some, especially for those who also want to use the netbook outdoors, is a minor matter for users who use the device mostly at home in interiors. Therefore, the reflective display is once again controversial. But as mentioned, who would have honestly awaited anything other than a glare-display from Sony? A comprehensive test of the new Sony Vaio W11 will follow. Stay tuned!